Light, easy and infectious tracks with a crisp, clean production value, simple musical approach and unique instrumentation. Pulsating percussion and other unique elements intertwine with various guitars, keyboards and coloristic accents to create activity with a purpose. 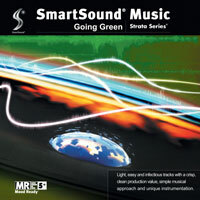 SmartSound's unique multi-layer music controls in both our Cloud system and in Sonicfire Pro allow for even more creative blending of the mixes to evoke a wide palette of moods ideal for many creative media productions.